Weston was back in Virginia, and is apparently on suspension for whatever happened during the Carroll investigation. Agent Phillips assures Weston that since he hasn’t been charged with anything yet, he can work the case. Hardy tells the media that he has no involvement in this, but is brought in anyway. A weird segment of the episode was seemingly thrown in in the middle. A man flirts with a woman in an apartment building, only to kill her, all the while carrying on with her as though she were still alive. The man was very creepy, so I was pretty sure he would end up being a part of whatever is going on. It turns out that it’s not just one man, but a set of twins. They show a flashback of Weston and Hardy meeting up 8 months earlier in a bar. Weston is telling Hardy what to say to the grand jury to be sure their stories sync up. At first I thought Weston was trying to save himself, but Hardy made it sound like Weston was trying to protect him. I’m sure more will be revealed, but I’m guessing something stemming from this is what led to Weston being suspended. Hardy, Weston, Agent Phillips, and Agent Mendes interview the survivor in the hospital, which is where they learn of the connection to Joe and Hardy. Hardy says he doesn’t know what is going on, and the agents act like he’s lying. But why would he know anything if he’s been teaching and going through rehab? I also wondered here if the surviving victim was just spared to give their message, or if she’ll end up being connected to the cult. They’ve done that before. Emma is with her cult friends, and they are seeing the news coverage of the subway murders. They have nothing to do with it, but wonder if Carlos has branched off on his own. Weston tells the other agents that there are 8 original cult members still unaccounted for. 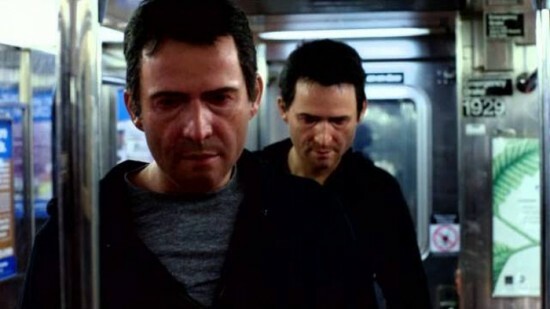 He runs their stats against the subway footage and come up with a possible match – Carlos Perez. The agents again ask Hardy if he knows anything, and he says that he doesn’t. And since he doesn’t know anything, he bows out of the investigation. Weston tries to convince him to stay, but he doesn’t want to work on the case. I felt kind of bad for Hardy, and then he went into a locked office in his apartment, revealing that he has been investigating the cult ever since Joe Carroll was killed. So he blatantly lied to the agents and I don’t feel bad for him anymore. He even has a file on Carlos Perez. It turns out that his niece Max is helping him to, as her connections as an NYPD officer lets her look up Carlos’ aliases. One of his aliases pulls up a recent address. Max tells Hardy to give this information to the FBI, but he tells her that they’ll find out soon enough and he goes off on his own to Carlos’ apartment. When he gets there Carlos attacks him but Hardy gets the best of him. Carlos tells him that Joe is alive, and that he picked Joe up at the beach after the boathouse exploded. But he hasn’t seen him since. Carlos runs away, and Hardy follows him, but is hit by a cab allowing Carlos to get away. Hardy refuses help and goes back to Carlos’ apartment, finding a Joe Carroll mask, a map, and a picture of Heather Clarke. Max tells Hardy that Heather Clarke is dead. Hardy goes to the murder scene, finding Weston and his team already there. Now Weston knows that Hardy knows more than he is letting on, but Hardy refuses to tell him anything. Hardy had even requisitioned Carroll’s DNA to prove that he had actually died in the boathouse. Carlos ends up at another apartment with some French girl, who scolds him for ending up on the news. The twins, Luke and Mark, arrive and one of them (Luke I think) is furious with Carlos. Carlos told them that he has done everything they asked, and he can get them Joe. Luke calms down a bit, and instead of killing Carlos, he karate chops him in the throat. Hardy goes back to the hospital to apologize to the surviving victim, as she is the only one he can apologize to. I got the sneaking suspicion that he’s going to end up falling in love with her like he did Claire. It will be all the more exciting if she is working with either of the cults. The episode ends with a girl sitting in the living room of a bordello watching the news about the killing. She yells for someone to come in and see the news (I thought she said Darrell, but maybe I just heard what I wanted to hear). The fact that they didn’t show his face until he came inside gave me a pretty good idea of who it was going to be. It was Joe Carroll! With quite the fisherman’s beard. Not quite Daniel Bryan or Eric Young, but a good effort nonetheless.